Five years ago Keith Jack was working in a supermarket, but dreaming of a life on the stage. Along came a certain reality show, masterminded by Lord Andrew Lloyd Webber, and the 24 year old from Edinburgh has never looked back. Keith (above) was runner up in the show 'Any dream Will Do', which at its peak, drew in 15 million viewers, eventually losing in the final to Lee Mead who went on to play Joseph in the West End. Keith has also made his mark on the stage too, and is currently touring around the UK in the same role, receiving critical acclaim for his performance as the prodigal son who returns to his eleven brothers and with his coat of many colours. In what's seen as a huge coup for Chesterfield, Keith and his company will be the first West End production show to perform at the town's Winding Wheel, and ticket sales have so far reflected that. Nearing the end of a 2-year tour (currently playing in Leicester) Keith and the Technicolour coat made a flying visit to Chesterfield ahead of the first show next Tuesday, where we caught up with him. An immensely likeable and warm lad with an obvious passion for the role, it is easy to see why audiences and critics have feted his performance throughout the UK. Enthusiastic and engaging, he admits that he can't quite believe his luck and how he feels that, despite his career being on the ascendant, he won't forget his roots and is committed to helping youngsters have the same chances. "It's been an amazing response! 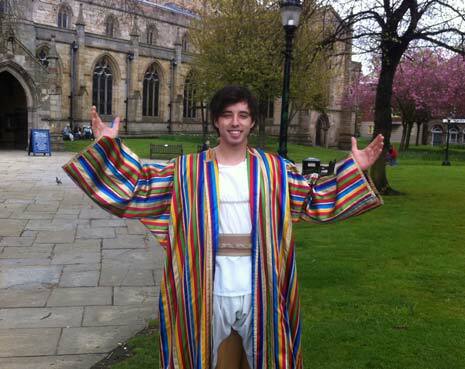 It's a timeless show - almost a tradition - that people go and see Joseph. It's pivotal to people's lives; they watch it as kids and then take their kids to see it and that's how it continues on. "It's great to work on and emotional for us too, even now. I like the bit at the end where I meet Jacob for the first time in years, you can feel the emotion in the audience - the emotion between the two of them, I get a lump in my throat every time I sing a slow version of Any Dream Will Do. I also get to wear a loin cloth!" "I go to the gym every day! When I was first offered the role, I was 9 stone, so I thought I needed to get to the gym. I trained for 3 months solid to get fit - that's why I look about 10 on the publicity photos!" "And I'm half naked for most of it! You want to look alright in the loin cloth, but not too body built - you kind of need to find a happy medium because though Joseph would have worked hard in the field, he wasn't a body builder." "It's incredible doing what you love, singing and being on stage every night." "I remember going to see Phantom and I remember being so moved. All my mates went to see it and were like, 'yeah it was good, but I'm not into that', and I cried at how good it was and I was so touched and inspired by it and I think that's a great feeling on stage - when you meet people at the stage door and they're like 'I've had such a rubbish day and I feel so much better now I've seen Joseph', that's a great thing, to be able to inspire people to do well. It's a nice feeling. "It's good to be on the road, you make a lot of good friends and people become like family." "To be part of the programme and come from working in a supermarket to singing in front of millions every week, working with Lord Lloyd Webber and John Barrowman was fantastic. I still have my coat in my house - though I can't fit into it anymore!" "The last time I saw Andrew Lloyd Webber was a year ago but I keep in touch with Lee (Mead), I was speaking to him this morning funnily enough, but you have to realise that everyone's busy. Ben Ellis is on tour just now and Lewis is doing a show, there's a lot of boys to keep in touch with but everyone has their own lives and are very busy." "Enjoy the experience - you're so nervous, there's so much pressure. We were up at 6am and finished at 12 every night, every day, then did the programme. You saw 2 minutes of VT and a 3 minute song but there was lots of preparation, and when it finished you'd think 'oh I wish I'd enjoyed that more' - so my advice to anyone would be enjoy it." "I was lucky because I'd auditioned for theatre schools in London and I was still going to musical theatre lessons. I was lucky to get the programme and so I missed all that training but it gave me a big boost. Though now I'm going back. I have a singing coach, an acting coach - for me it's about constantly growing and learning - and I work all week as well as doing the show. "You have to constantly learn, I remember one interview with Pavarotti and he said that the day you think you've learned everything is the day you should give up. He still went for singing lessons even in his prime and some people get that reality TV thing and just sit back. If you do well on the programme, the hard work comes after." "I need to move back to London and then I have lots of concerts and an album to record in the summer, with a tour at the end of the year. That could all change though as I have a US agent and he wants me to go over there to do some stuff. It could all change - I could get a job and not be back here for a while. That's what I love about this industry, a couple of years ago I got offered a role I was going to accept and then two days later Joseph came up, so I went to do that. I'll start the album in June and it will be finished by November. You don't know what's coming next!" "I own my own theatre school in Edinburgh - it's great because before I did it, I went round other theatre schools and I felt I could do more and make it more relevant and modern. The kids I have had a master class from Connie Fisher (a fellow Andrew Lloyd Webber winner) - we had a big grand opening with the casts of Les Mis, Mamma Mia and Mary Poppins there so they've had all the people, met all the casts, met the people." "We got quotes from Ed Sheeran and John Barrowman. John said 'kids who play an instrument or learn performing arts, even if they don't use it in life, develop great life skills'. We don't audition at our school, some of our kids are great dancers or singers, but some have come from a place where they sit on the corner not doing anything. "One girl we have has a problem with her legs and now she gets up and dances. She has so much confidence, she got up and sang at school, and her mum says that even her schoolwork has got better because she's gained In confidence and that's a great thing to see. I get that fatherly proud thing without having kids! It's amazing to see them grow. We have so many kids who have the chance to go into musical theatre and it's about pushing them forward and being a part of it." "The Phantom! That's my ultimate dream, but that's a while away yet. It's a great part, fantastic, there's so much more than the character, he's so hurt, he has this dark side but also this romantic hurt. There are so many levels and it's great to watch. I'd love to bring that depth across. The songs are amazing. That and Les Mis are my favourites."